One of the things that struck me about this splendid movie was the way it’s photographed and lit. Another thing is the general lack of commercial signage in both the internal and external scenes. It’s an oddly sterile middle class urban future that’s presented here where annoying visual corners seem to have been knocked or sanded off. Some will like this, some won’t. The director of photography is Hoyte van Hoytema. You notice the visual similarities between this movie his work in Interstellar. Van Hoytema’s look is as distinctive as Janusz Kamiński ’s work for numerous Spielberg movies such as AI Artificial Intelligence. It’s worth commenting on how this film looks since everything in this movie is created to support the story and blended into a unified whole. The director’s obsession with detail permeates everything including, of course, the numerous computer systems use during the film; it’s a pleasure to see a lack of keyboards! 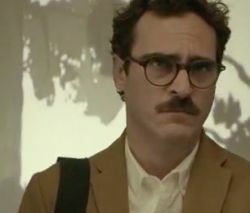 The central focus of the movie is the relationship that evolves between Joaquin Phoenix’s character and the disembodied AI voiced so convincingly by Scarlett Johansson. It’s hard to believe that Phoenix is the same actor as the main character in The Master and the depraved emperor in Gladiator. What’s also amazing is how much personality and life comes through just from Scarlett Johansson’s voice. Her performance here is almost the direct opposite of the opaque character she plays in Under the Skin.